I recently spent a couple days at the International Network of Golf annual conference in Atlantic City NJ and here are some of the new products and services I discovered while I was there. This is an all in one pushcart and golf bag— these units are all one piece and fits easily in your car trunk. It features four large easily detachable wheels with a strong enough club cover that it can also serve as your travel bag (no outside travel bag needed) and it takes just seconds to set up. It’s also easily converts to a cart bag. Knuth Golf Dean Knuth had developed a new driver called High Heat. It is USGA conforming and is longer and far more forgiving than the major brand drivers. Its unique feature is its greatly increased sweet spot. Its in beta testing and should be avail in Sept 2014. I hit several shots of the prototype on the range and I want one when they come out. Nexbelt Is your belt holes sometime just a bit too tight or too loose because of the proximity of the buckle holes? Nexbelt has no holes and has developed a racheting system that lets you adjust it to the next 1/4 inch. They have many snappy designs and for both golf and causal wear. I also learned that years ago, at a match at Atlantic City Golf Club the terms "Birdie" and "Eagle" were first coined. It may, at first, seem like a retirement community but, in fact, substantially less than 1/2 of its residents are retired. Joel Cowan the founder of Peachtree City, told us “We didn't want second home buyers, our target market from the beginning was a diverse cross section of pioneers to join this community” It is simply a small town in an almost rural setting in close proximity to the thriving metropolis of Atlanta. 38,000 people live here. But here is the part that I found intriguing, there are approx 8,000 households and 10,000 golf carts. (thats 1.2 carts per family) In fact we drove by the high school on Friday afternoon and the parking lot is full of golf carts. That is how the High School kids of Peachtree City get to and from school. Wyndham Peachtree is located on 19 acres of lush forest with a 10,000 Sq foot fitness center, and 250 guest rooms. They have more great food— the restaurants in these two hotels are good enough that there may be no need to wander out- but you probably don't want to miss some of the special area restaurants. There is plenty of golf here.. 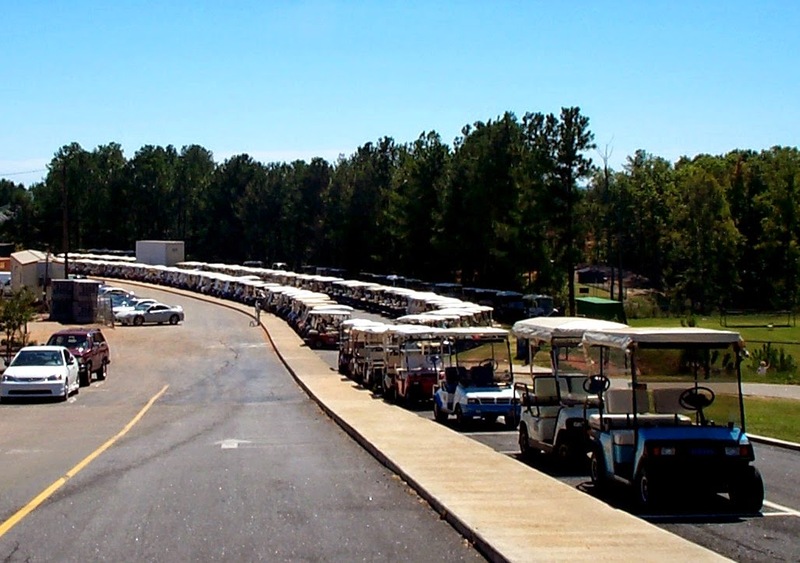 The people at Cannongate own and operate 22 golf clubs in the Atlanta area. Six of them are within a 15 mile drive of Peachtree City and three of them are right here in town, Planterra Ridge, Flat Creek Club and Braelinn. Tonight we saw Gladys Knight at “The Fred” and this woman, at the age of 69, can still belt out “Midnight Train to Georgia. She even had one Pip with here. One final note I know its called Peachtree City but we were told there isn’t a Peachtree anywhere in the city. Go Figure! !